Inland public transportation is available on the island on a daily basis making travel on the island very convenient to visitors. Buses and vans for hire or V-hires ply the route to all points of the island. 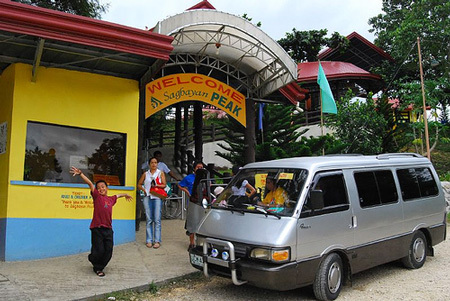 Short trips or town to town travel are served by small vehicles such as multi-cabs or jeepneys aside from the big buses that pass by the towns in route to other places. 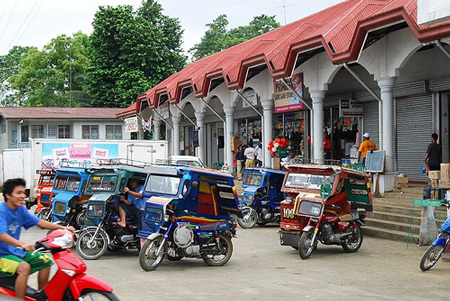 Within the city of Tagbilaran, tricycles, jeepneys, and multi-cabs are available; while in the towns, tricycles are often the mode of transportation. From within the town to inner barrios, tricycles and single motorbikes or “habal-habal” are used. In Tagbilaran City, the only city of the province, an integrated terminal is available – the Dao Integrated Terminal. Buses and vans or V-hires wait here for riders at an interval of more or less 30 minutes in between from dawn until dusk. If riders are a-plenty and the vehicles are fully loaded, it will leave immediately. If not yet full but the designated time is up, the vehicle has to leave to give way to the vehicle next in the line. 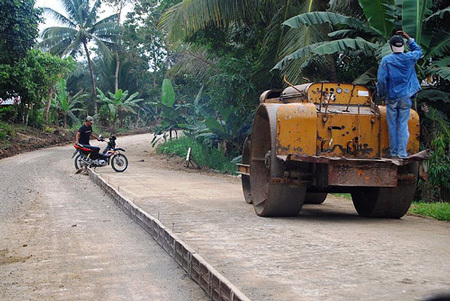 The Circumferential road is in very good condition, cemented and asphalted on some parts. The roads are well maintained with the weeds and grasses along the sides regularly trimmed. The interior road is also in good condition. Some parts are cemented while some portions are asphalted. Only side roads or fedder roads are undeveloped though those leading to beautiful spots have been improved. Vans or V-hires, as we locals call them, are available; especially in major towns of Bohol such as Tubigon, Talibon, Carmen, Guindulman, Ubay, Trinidad, Tagbilaran and others. These vehicles are all available at the Dao Integrated Terminal and specified towns. They ply their designated routes although they can also be hired for group tours. Tagbilaran-Talibon route charges a minimum of P120.00 per head. Midway or to Tubigon, they charge P60.00 per head. Usual capacity of a van is fifteen (15) including the driver. Saint Jude Line is the oldest serving bus line in Bohol. 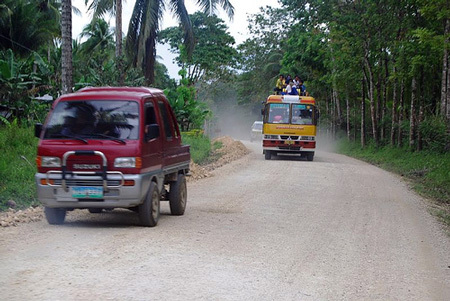 Their buses ply the interior road and the eastern road of Bohol. 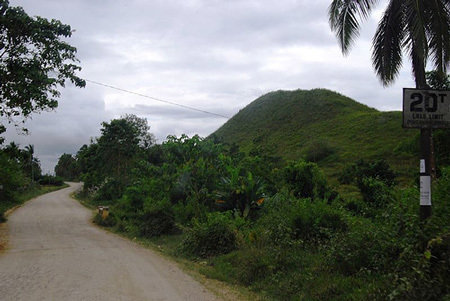 They have several buses at end points of Bohol such as Tagbilaran and Talibon; both having dawn trips until dusk. An air-conditioned bus is available. Veloso Line buses ply the north road up to Talibon and vice versa. A special bus makes a round-trip of the island using the coastal roads. Both bus lines charge the same fare whose tariff is established by the government. 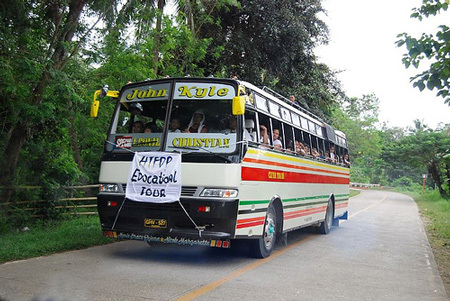 For the Tagbilaran-Talibon route, which takes more than 100 kilometers, the buses charge P100 yet usually give discounts to students, senior citizens and even to regular patrons. Both lines accepts group and scheduled tours to specified beautiful spots of the island on per hour or per day basis. Tricycles are suitable for short distances though it is also possible to hire a tricycle by the hour and take a leisurely sightseeing tour from one town to another. There are two types of tricycles: the motorized tricycles and the manually paddled ones. The motorized tricycle has a motorbike attached to a rickshaw while the other has a bicycle attached to one. At present, a minimum fare of 6 pesos is charged for the first five kilometers. Habal-habal’s are a common sight in the barrios, especially those located in remote areas or mountain barangays. These are single motorbikes with extended seats that can accommodate up to six (6) people. Makers of the motorbikes never envisioned their products to carry more than two (2) people yet, the sagacity of Filipinos, especially Boholanos, make them carry more thus earning extra in the process. 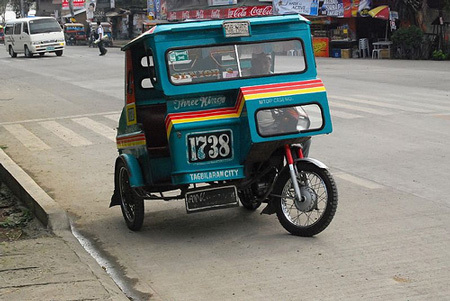 Taxis are not as prominent in the province as in other parts of the Philippines; however, it is available in Tagbilaran City. 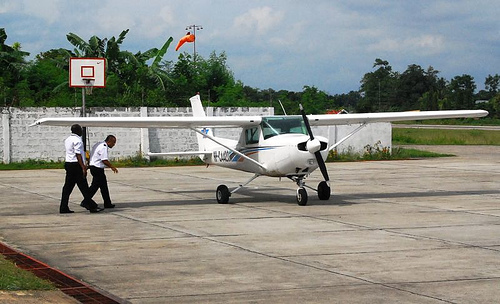 The taxis can be chartered for journeys to all points of Bohol. All taxis are air-conditioned so tourists are afforded with the convenience and comfort of traveling to specified places of interests in their lists. Taxis though can only accommodate more or less six (6) passengers excluding the driver. They are found in major shopping malls, hotels and generally within the city area. 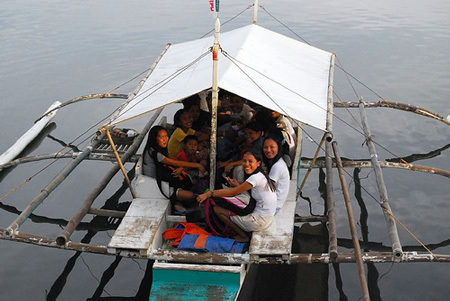 They are available in both the seaport and airport of Tagbilaran and convenient for small groups who are bound for Panglao Island. 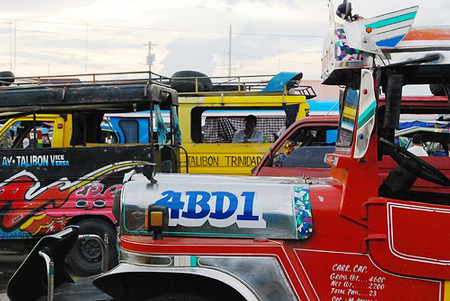 Jeepneys are long-bodied jeeps that can accommodate more that fifteen (15) passengers. These vehicles are very attractive with hoods brightly decorated usually with metal horses or eagles, mini flags and others. Inside, the windshields are often decorated with short curtains at the edges with a hanging décor at the center. These quitespacious jeepneys are the product of Filipino ingenuity in terms of decoration and style. Multi-cabs are small vehicles that can accommodate two (2) small persons in the front seat and more or less 10 persons at the back. The back portion consists of two long seats facing each other. Ten regular-sized passengers can fit into the two seats. Both vehicles charge a minimum of six (6) pesos for the first five (5) kilometers and gradually increase as the travel lengthens. Routes and fare are specified by the government traffic management office.